Domino’s Pizza is launching yet another delivery revolution in the USA. Over 150,000 Domino’s Hotspots are now active nationwide so that customers can receive delivery orders at spots that don’t have a traditional address – places like local parks, sports fields and beaches, as well as thousands of other unexpected sites. Local Domino’s stores around the country have selected these Domino’s Hotspots, which are now locations where drivers can meet customers curbside to hand off orders. Domino’s Hotspots are online-only for prepaid orders on dominos.com and in mobile apps. Once a customer’s location has been determined, local Domino’s Hotspots that are available for delivery will appear on a map for customers to select. Before checking out, customers can leave instructions to help the driver find them. After completing their order, customers will receive text message alerts about their Domino’s Hotspot delivery progress, including a final text that gives the estimated arrival of the driver at the hand-off spot. 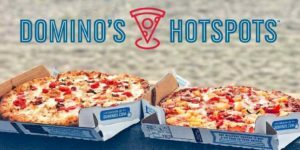 “Now customers spending time at some of our new Domino’s Hotspots locations, like Tommy Lasorda Field of Dreams in Los Angeles or even next to the James Brown statue in Augusta, Georgia, can have a pizza conveniently delivered to them, thanks to our innovative Domino’s Delivery Hotspots,” continued Weiner. One Response to "Domino’s creates 150K hotspots to deliver pizza almost anywhere"